The European bison (Bison bonasus), also known as wisent or the European wood bison, is a Eurasian species of bison. It is one of two extant species of bison, alongside the American bison. 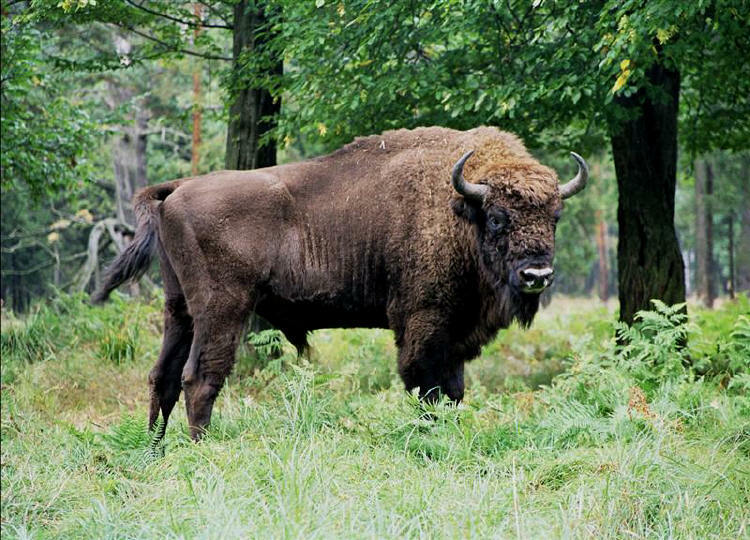 European bison were hunted to extinction in the wild, with the last wild animals being shot in the Białowieża Forest (on the Poland-Belarus border) in 1919 and in the north-western Caucasus in 1927. They have since been reintroduced from captivity into several countries in Europe, all descendants of the Białowieża or lowland European bison. They are now forest-dwelling. They have few predators (besides humans), with only scattered reports from the 19th century of wolf and bear predation. European bison were first scientifically described by Carolus Linnaeus in 1758. Some later descriptions treat the European bison as conspecific with the American bison. It is not to be confused with the aurochs, the extinct ancestor of domestic cattle. In 1996, the IUCN classified the European bison as an endangered species. It has since been downgraded to a vulnerable species. In the past, especially during the Middle Ages, it was commonly killed for its hide, and to produce drinking horns.